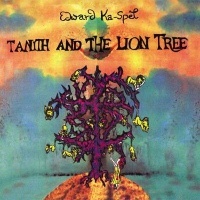 Edward Ka-Spel's solo album Tanith and the Lion Tree has had a convoluted history. First issued on Gary Levermore's Third Mind label, it was reissued by SPV and then released on vinyl in an expanded edition on the Flesh Eating Ants label. This remastered edition on Cold Spring drops the "Diary" tracks from the Flesh Eating Ants edition replacing them with a fresh reworking of older tracks, alongside an instrumental. Alongside his work with the Legendary Pink Dots, Edward Ka-Spel had issued a number of solo-releases prior to Tanith and the Lion Tree but this was the first one not to use the "China Doll" suffix that up till now had featured on all his solo release titles. With Edward Ka-Spel 's peculiarly English accented voice at the fore on a number of tracks Tanith and the Lion Tree covers a broad range of musical styles and textures, together with some instrumental experimental pieces. Tanith and the Lion Tree opens strongly with one of Ka-Spel's finest tracks, 'O' From The Great Sea'. Twisting and turning from piano passages to thunderous piano chords, Edward Ka-Spel is in accusatory mode with his biting observations on man's propensity for hate, death, decay and destruction. With experimental passages passage loaded with effects leading to the closing verse, where his treated voice continually asks "Why? Why? Why?" to the accusations of evil levelled at this latter day Lucifer figure. 'O' From The Great Sea' certainly rates as one of his best compositions, from any of his countless projects. The title track which follows is performed as a piano ballad, reminiscent of a Victorian piano score, with Edward Ka-Spel, as twisted storyteller, narrating a black nursery tale in his hushed Syd Barrett-esque tones about Tanith and her Lion Tree. The entire track, like much of Tanith and the Lion Tree, toys with passages of electronic and atmospheric effects. It segues into 'Interference', the first of a number of instrumentals and loop based tracks spliced throughout the album. These atmospheric interludes coupled with the drastic changes in musical styles has, at least on cursory listens, a tendency to blur any sense of cohesion on Tanith and the Lion Tree as it veers from harshness to tranquillity making it all quite patchy, offering diminishing returns as it progresses. That's not to say there aren't any other memorable moments. The abstract electronic bleeps and parping electronics of 'Four Out Of Ten' comes over all Coil-like, a comparison that is heightened by Ka-Spel's distinctly English accented wordplay. Then there's 'The Bakersman' with its cheap Casio electronics and some classy finger picked guitar, to which Ka-Spel sets his rhythmic vocal delivery to a sped up metronome. Even here just as it's about to end the song is fleshed out with electronic effects. Another highpoint arrives in the form of 'Prithee', which is an unabashed love song. Here, Ka-Spel's unadorned, carefree voice which opens this immediately brings to mind the traditional US staple "You are my sunshine" just as synthetic cello strings enter as an accompaniment. With his voice multi-tracked, framed by a melodic piano score, the entire thing is tender and quite beautiful: "Shall we chase rainbows? Ride the stars by night? Stay close, Be my second sight. Show me our tomorrows,'Cause I can't dream alone..."
Pumping electronics return on 'Prisoners of War' with Ka-Spel's voice heavily reverbed, while 'Hotel X', another tale of love, captures a solemn atmosphere with Ka-Spel's despondent half-sung delivery ending on melodic piano score. Things get more chaotic again on 'Phoney War' where Ka-Spel inhabits the character of a frontline soldier, in a lyric riddled with the accoutrements of war, over cut-up rhythmic electronics, slicing electronics and keyboard chime, ending on a mass of effects surrounding the instruments. The assortment of loop based tracks reaches its pinnacle on 'Old Man Trouble', a track which closed the original full length album. This one is a slice of industrial psychedelic experimental music closer to the work of Nurse With Wound, who of course Ka-Spel had worked with and struck up a friendship previously. The extra tracks include 'Don't Look 'Til It's Gone 2012', a reworking of a collaboration with Dark Star. Here Ka-Spel's pensive voice, occasionally reverbed, hovers over light hand rhythms and swathes of subdued electronics, light effects and soft bass tones. It's another good track. The updated version of 'Prisoners Of War 2012', which is couched in vinyl pops and war voices before it launches into pulsating electronics with a much more agreeable vocal than the earlier tentative one. Yet another loop based track completes this new edition.